Newcomer Nate Simpson Debuts at Image with "Nonplayer"
Bart Simpson Breaks Out is a new trade paperback comic book collection from Harper Design. Bart Simpson Breaks Out collects comic book short stories and short gags that were originally published in the comic book series, Bart Simpson, specifically issues #78, #79, #80, #81, #82, and #83. (cover dated: January 2013 to May 2013). Bart Simpson is one of the lead characters in the long-running animated television sitcom, “The Simpsons” (Fox). “The Simpsons” presents a satirical depiction of a working class family which consists of Homer Simpson (the father), Marge Simpson (the mother), Bart (the oldest child and only son), Lisa (the precocious and brilliant elder daughter), and Maggie (a baby girl). “The Simpsons” also parodies American culture, pop culture, society, politics, media, etc. via the denizens of The Simpsons home town, Springfield. In 1993, Bongo Comics Group (or simply Bongo Comics) began publishing numerous comic book series and single-issue publications based on “The Simpsons.” Beginning in 2000, Bongo gave Bart his on title, Simpsons Comics Presents Bart Simpson (or simply Bart Simpson). The comics presented in Bart Simpson Breaks Out collects stories published in the final quarter of the series. Bart Simpson ended with issue #100 in 2016 (and Bongo ceased publishing in 2018). THE LOWDOWN: I really enjoyed the previous Bart Simpson trade paperback, 2018's Bart Simpson Bust-Up, and I happy to tell you, dear readers, that Bart Simpson Breaks Out is just as good. The opening story, “The Booty” (written by Pat McGreal and drawn by Rex Lindsey and Dan Davis), is a cute story with a funny pie-eating contest in the middle. However, Breaks Out really... breaks out with the second story, “I'd Rather Bleed Than Read” (by Shane Houghton, Nina Matsumoto, and Andrew Pepoy), which finds Principal Seymour Skinner trapping Bart in the Springfield Elementary school library in order to force the lad to read at least one book. The resolution to the story is rather novel, if not a stroke of genius. “Bartman vs. Doctor Octuplets” (by Ian Boothby, John Delaney, and Pepoy) is one of two stories featuring Bart's superhero alter-ego, “Bartman.” It has a neat take on Spider-Man villain, Doctor Octopus, via Kwik-E-Mart manager, Apu Nahasapeemapetilon, and his brood of children. The second Bartman story, “Who the Bartman?” (by Arne Kaplan, Tone Rodriguez, and Pepoy), offers a novel take on how Bart's classmates view Bartman. Breaks Out has two Maggie Simpson stories written and drawn by the great alternative comic book creator, Carol Lay. The first one, “Maggie and the Moon,” is quite poignant and beautiful. That heartwarming vibe also makes an appearance in the story, “The Todd & the Rodyssey” (by Mike W. Barr, Delaney, and Pepoy). Ned Flanders is a featured character here, but his sons, Rod and Todd, are the stars of this story of escape and survival. The last two panels of this fast-moving and delightful comic presses all my buttons of sentimentality. The other stories are also pretty good, especially the Springfield Elementary “Junior Mafia” tale. I got a kick out of “The Demon” (by Max Davison, Delaney, and Pepoy), because I generally like ghost story-themed tales told in a kids' comic books published by everyone from Archie Comics to whatever company is publishing comic books featuring Disney characters. In some of my reviews of Simpsons Comics paperback collections, I have said that one does not have to be a fan of “The Simpsons” to like them. This is the case with Bart Simpson Breaks Out, because this book is full of top-notch humor comics. 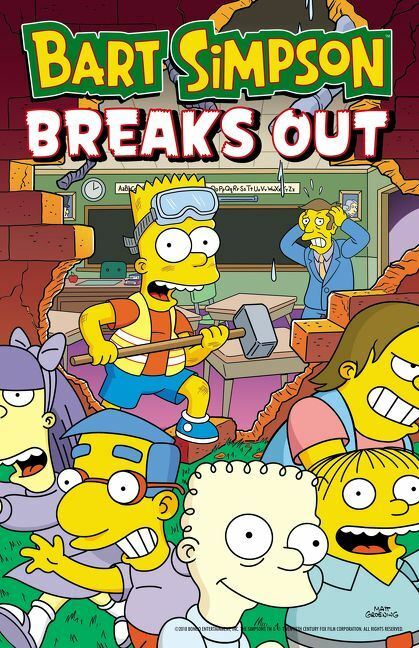 Bart Simpson Breaks Out is too funny to pass up. I READS YOU RECOMMENDS: Fans of “The Simpsons” and of excellent humor comics will want Bart Simpson Breaks Out.